Do I need to prepay for Ice Skating Lessons? Yes. We take prepayment in order to secure your place. Do I need to book an ice skating session in advance? There is no need to pre-book an ice skating session but it is advisable to visit our website for session times to plan your visit. Where do I keep my personal items when skating? What size of skates do you offer? Are you closed over the Christmas period? Yes there is a car park located on the premises for the use of all Dundonald International Ice Bowl customers. Do you supply birthday party invitations? Yes. 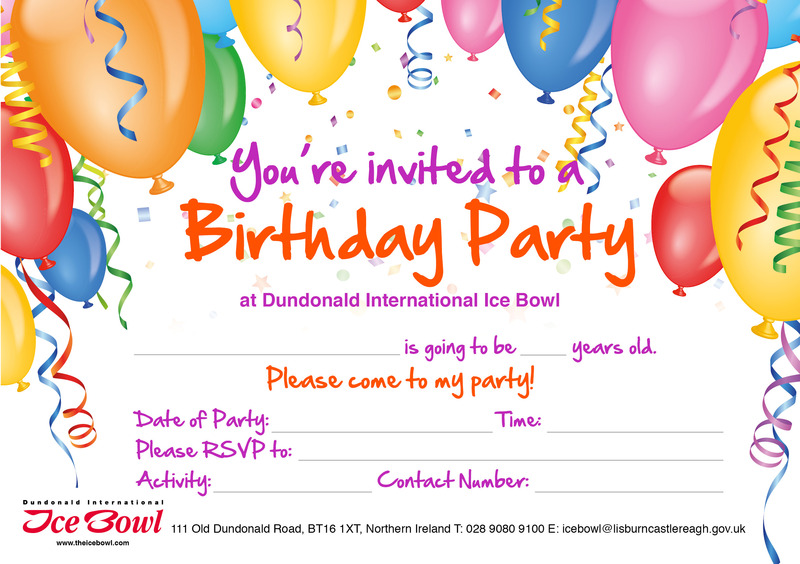 Dundonald International Ice Bowl has had party invitations designed for your use. You can download, print at home and issue the invitations to guests ahead of your party.